The storage of passwords or documents ultimately always takes place according to defined organisational structures. The module enables arbitrarily complex structures to be defined, which later form the basis for the systematic storage of data. It is often possible to define them on the basis of already existing organigrams for the company or the department. Of course, it is also possible to use other criteria, such as the function / activity performed, as the basis for creating hierarchies. It is always up to the customer themselves to decide which structure is most useful for the purpose of the application. The configuration of Masking is explained in a similar way to the other modules in one place. The following options are required for adding new organisational structures. The operation of the ribbon differs fundamentally in a couple of aspects to how it works in other modules. The following section will focus on only those elements of the ribbon that differ. The remaining actions have already be explained for the password module. Permissions: The configuration of permissions within the organisational structure is important both for the administration of the structure and also as the basis for the permissions in accordance with inheritance from organisational structures. The benefits of ”predefining rights” are explained in a separate section. Reset password: Administrators can reset the passwords with which users log in to Password Safe to a defined value. Naturally, this is only possible if the connection to Active Directory is configured via end-to-end encryption. In the alternative Master Key mode, the authentication is linked to the correct entry of the AD password. *To reset a user password, membership for the user is a prerequisite. The example below shows the configuration of a user where only the user themselves is a member. This configuration means that the user password cannot be reset by administrators. The disadvantage is that if the password is lost there is no technical solution for “resetting” the password in the system. !It is*not* recommended to configure the permissions so that only the user themselves has membership. No other interventions can be made if the password is then lost. 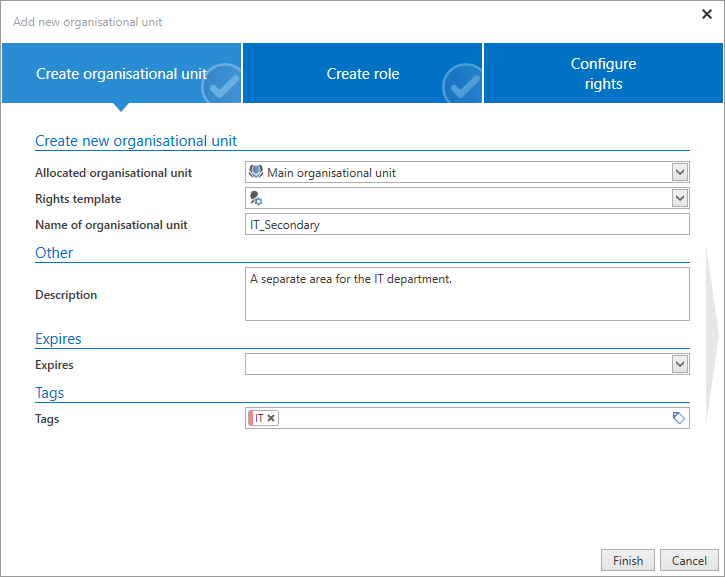 *The organisational unit marked in list view will be used as a default. This applies to the fields “allocated organisational unit” and also “rights template”. 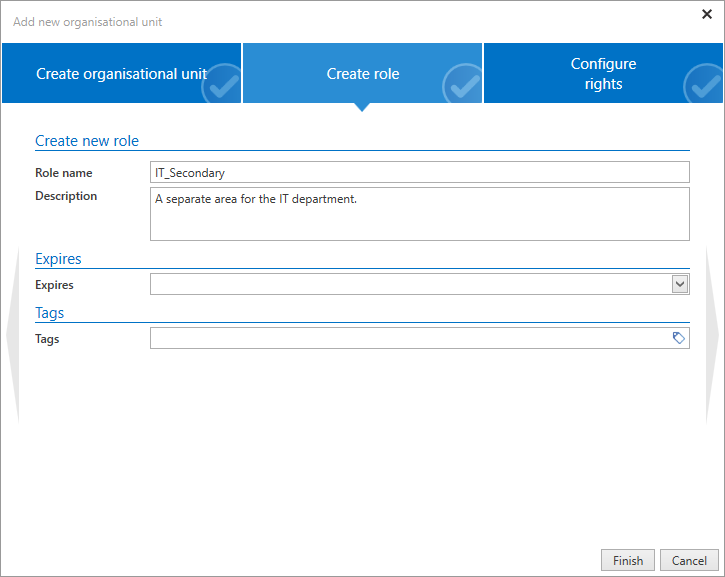 When creating a new organisational unit, the second tab in the wizard enables you to directly create a new role. This role will not only be created but also given “read” rights to the newly created organisational unit. The third tab of the wizard allows you to define the permissions for the newly created organisational unit. 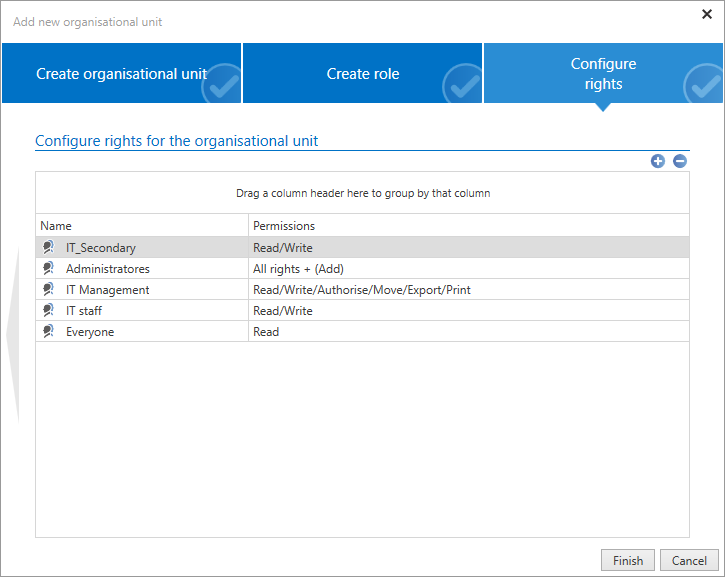 If an allocated organisational unit or a rights template group was defined in the first tab, the new organisational unit will inherit its permissions. Here, these permissions can be adapted if desired. *The organisational structure module is based on the WebClient module of the same name. Both modules have a different scope and design but are almost identical to use.